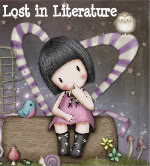 I love books--- paranormal, urban fantasy, romance of any kind, historical fiction, YA, and many others. Political or self help are about the only kind I don't pick up. Philosophy is defined as a theory underlying or regarding a sphere of activity or thought. Well, my theory is if I can add at least 10 new books to my Wishlist and move at least 5 older Wishlist selections to my TBR list every month, then life is a ice cream sundae. And if I can find those 10 books from at least 5 new blogs each month then that's the cherry on top. NEW VISITORS AND OLD- WELCOME! Well, I've made it almost 5 years now, so for better or worse, I continue on. I tend to blog in spurts as the urge to be creative erupts. As I don't have an artistic bone in my body, you will see very few changes in the layouts. Hey, I'm a reader not an artist like so many of the awesome bloggers I follow. I know you don't always have the time but if you stopped and looked, take a half a minute and say your piece. Recommend a book that you have enjoyed or hated for that matter. Thank you to all who visit. Oh, and I moved my Google Friend Connect info and share this buttons to the top, as without our friends, who are we? 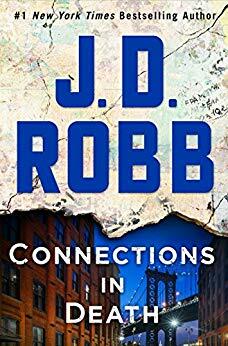 I never thought I'd see the day that I gave a JD Robb/Nora Roberts book a one star review. While this was absolutely the dullest murder mystery that Eve Dallas has ever been involved with, I also have my doubts that it was penned by Robb. There is none of the clever wit, snarky humor, or warmth that I have come to expect when reading an IN DEATH book. There was no clever evil doer that Eve matched wits with. It was blah! It was so flat, no life at all to the story. I've been less than satisfied with the last couple of books in the series but this one was a new low. All the characters were there, Eve , Roark, Somerset, Peabody, Feeney, McNab, but none of the life that you expect from this series. Thank goodness it was a library book. I thought I might be getting burned out on the series so after the last book I started listening to the series as audio books and nope they were as great the second time as the first. The newer books just fail to rise to the level of the earlier books. So as much as it grieves me it may be time to pull the plug on what has up to now been my favorite on going series. Ahhh, a very satisfying read!!! Although I thought I had figured out part of this mystery, I was pleased that the author threw in enough curves to keep me guessing but still stay true to the story. It was at times horrifying and totally had me wiping tears from my face while still offering a look at the resilience of the human soul. All of the characters were well flushed out and even the minor ones were believable. The villains were evil but humanized by the events in their lives. In general, I don't like a story told from multiple viewpoints but it absolutely worked in this instance. 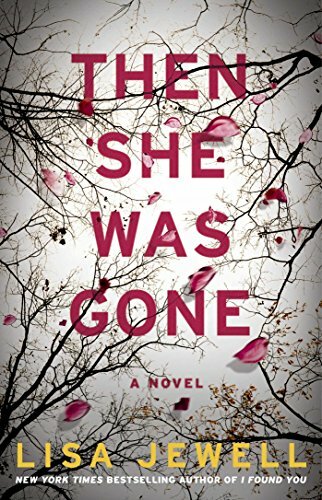 As a parent, I can't imagine the unbelievable horror of having a child disappear without knowing what has happened but I'm not sure if Laurel had known the intimate details of Ellie's disappearance if it could have been any less horrifying. While there is a satisfying ending to the story, the trip is full of bumps and turns that makes it impossible to slow down or take a break until the end is reached. While I loved Emily Blunt as Mary Poppins, Joel Dawson as Georgie Banks stole the show. He was so adorable. I probably have not seen the orginal Mary Poppins in 30 years so I'd probably forgotten more than I remembered. This wasn't a bad thing as I wasn't constantly comparing the two movies. 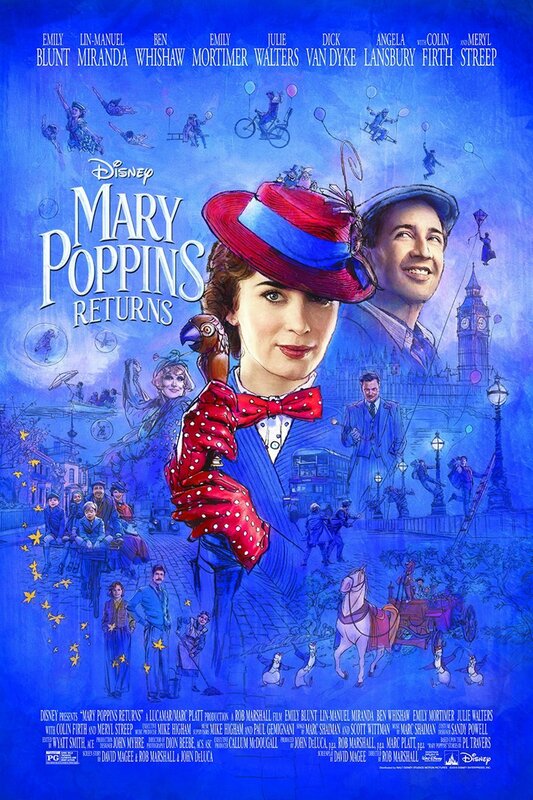 I was able to just sit back and enjoy Emily Blunt as Mary Poppins and the fabulous musical numbers. So grap a big bag of popcorn, a cold drink, and sit back and enjoy. Lo Blacklock, a journalist who writes for a travel magazine, has just been given the assignment of a lifetime: a week on a luxury cruise with only a handful of cabins. The sky is clear, the waters calm, and the veneered, select guests jovial as the exclusive cruise ship, the Aurora, begins her voyage in the picturesque North Sea. At first, Lo's stay is nothing but pleasant: the cabins are plush, the dinner parties are sparkling, and the guests are elegant. 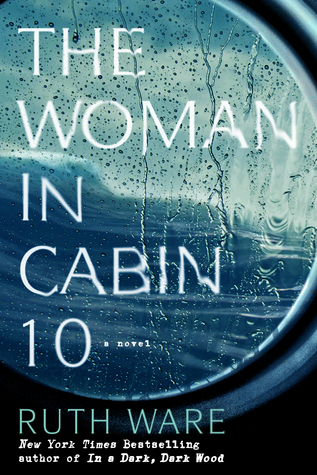 But as the week wears on, frigid winds whip the deck, gray skies fall, and Lo witnesses what she can only describe as a dark and terrifying nightmare: a woman being thrown overboard. The problem? All passengers remain accounted for and so, the ship sails on as if nothing has happened, despite Lo's desperate attempts to convey that something (or someone) has gone terribly, terribly wrong. First of all, loved this cover. There's something about rubbing your hand over a book cover and actually feeling it that always pleases me. But as "they" say, "You can't judge a book by it's cover." That said, I didn't love the book. It wasn't bad just not very thrilling more blah than anything else. It wasn't a quick read, I had to push myself to finish it. Not sure I would have if it hadn't been a book club book. 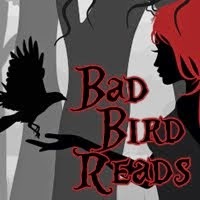 I liked the premise of the book and the murder mystery was twisty enough to keep me reading but I didn't connect with any of the characters at all. I found Lo particularly unsympathetic and found her final act to be totally out of character with how she was throughout the entire book. There were too many moments in the book where I really didn't care what happened next to outweigh the twisty moments. While I figured out part of the who dun it, gotta admit I wondered for a very long time if the initial break in had anything to do with the murder. All in all, not the best psychological thriller I've read but definitely not the worst. Ruth Ware grew up in Lewes, in East Sussex. After graduating from Manchester University she moved to Paris, before settling in north London. 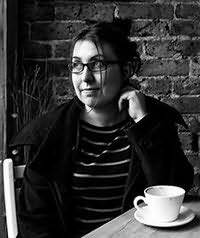 She has worked as a waitress, a bookseller, a teacher of English as a foreign language and a press officer. Married, with two small children, In a Dark, Dark Wood is her debut thriller. Freya de Moray is many things: a member of the secret order of Wise Women, the daughter of disgraced nobility, and a chaperone living under an assumed name. What she is not is forgiving. So when the Duke of Harlowe--the man who destroyed her brother and led to the downfall of her family--appears at the country house party she's attending, she does what any Wise Woman would do: she starts planning her revenge. Christopher Renshaw, the Duke of Harlowe, is being blackmailed. Intent on keeping his secrets safe, he agrees to attend a house party where he will put an end to this coercion once and for all. Until he recognizes Freya, masquerading amongst the party revelers, and realizes his troubles have just begun. Freya knows all about his sins. Sins he'd much rather forget. But she's also fiery, bold, and sensuous-a temptation he can't resist. When it becomes clear Freya is in grave danger, he'll risk everything to keep her safe. But first, Harlowe will have to earn Freya's trust-by whatever means necessary. Features a bonus novella from New York Times bestselling author Grace Burrowes! While this isn't Maiden Lane (which I loved, loved, loved), I still enormously enjoyed the start of Hoyt's new series. Hoyt manages again to create some simply awesome heroines and heroes. Freya is definitely not the typical female from 1760 London nor is Christopher the typical Duke. It's always a treat to get to read a new book by Hoyt and it blew me away to realize that it was almost 500 pages long. (One of the things I love and hate about the Kindle is not getting a true feel of the length of a book. I always feel kind of shocked and sad when I realize the story has ended.) It was a weekend read for me that seemed to speed by much, much to fast. Presumably, I slept and ate this weekend (I don't recall) but obviously I must have had the Kindle attached to my hand most of the time as I did finish it so quickly. I love Hoyt's details of life from both the upper class point of view and the staff's. It's rather like getting a Downton Abbey moment with Hoyt's particular recipe for suspense and romance blended to produce a meal that is totally satisfying and filling. One additional note that I just must add, if you haven't read the Maiden Lane series, it is now complete. Picking up this series for a binge read would be so awesome and I almost hate (nah, not really) I've already read it all cause I never reread a series. Just not enough time to indulge in rereading no matter how great it was. 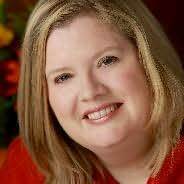 Elizabeth Hoyt is the New York Times, USA Today, and Publishers Weeklybestselling author of historical romance, including reader favorite, The Raven Prince. Elizabeth was born in New Orleans but grew up in St. Paul, Minnesota. She was fortunate to be able to travel extensively as a child, visiting St. Andrews, Scotland; Germany; France; and Belgium. She spent a year in Oxford, England and was a summer exchange student to Kawasaki, Japan. Elizabeth has a BA in anthropology from the University of Wisconsin at Madison and, as a result of having no clue what to do with her life thereafter, a career history as a barista, a (terrible) sales clerk, a Wisconsin Revenue Service data entry slave, and an archeological field work grunt. Fortunately, Elizabeth married relatively young and produced two children who kept her busy until her mid-thirties. At about this time, when her youngest was entering Kindergarten, Elizabeth’s mother hinted that perhaps Elizabeth should get a Real Job. Sadly, Elizabeth was so delusional she thought writing a romance novel might qualify as a Real Job. But! Five years later, to everyone’s surprise, she actually sold that romance novel (The Raven Prince) and began a rather successful career as a Romance Novelist. This was most fortunate since Elizabeth is singularly unqualified to do anything else but Make Up Stories. Since then Elizabeth has written over twenty books to critical acclaim including three contemporaries under the pen name Julia Harper. Elizabeth lives in Minneapolis, Minnesota with three dogs, a garden in constant need of weeding, and the ever faithful Mr. Hoyt. What is a Thumper Award? This is what I give books that are a DID NOT FINISH. World Autism Awareness Day – Meet Garon!! Ellie Jordan, Ghost Trapper releases today! Sync 2014 Preview – Free audiobooks this summer! 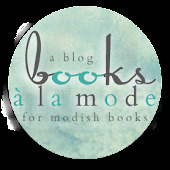 BooKrushed: For the love of books! 2012 Multi-Cultural YA Book Challenge!! These giveaways will be starting soon! Simply click on pic to take you to amazing giveaways! In accordance with new FTC guidelines regarding endorsements and testimonials for bloggers, I would like my readers to know that many of the books I review on Lisa's Loves Books of Course are provided to me for free by the publisher or author of the book. I do not receive money for such reviews. These books are sent to me for an honest review. If you have any questions, please contact me.